Does contemporary dance have a responsibility to bring us joy? 'Mortal Condition' choreographed by Larissa McGowan. Photo courtesy of McGowan. Few would argue that one of the most wonderful parts of being human is the capacity to dance, and the potential for dance to bring us joy. But it does so much more than this. Whether you are the dancer or the observer, the experience of dance can open up a whole raft of human emotions. And isn’t joy so much sweeter when we feel it in contrast to despair, loneliness, anger, sadness or anxiety? ‘Involuntary’ by Katrina Lazaroff. Photo by Chris Herzfeld, Camlight Productions. This month, Dance Informa presented me with an interesting challenge: to explore the perception that one dance genre in particular has a tendency to wallow in the darker emotions of wanting, reaching and desperation. Can you guess which one? It’s a genre that has its roots in a reaction against the rules and restrictions of the much older dance form of classical ballet. Beginning in the early 20th century with modern dance pioneers such as Isadora Duncan and Martha Graham, and resulting in today’s diverse collection of techniques and approaches, it is known by the umbrella term “contemporary dance”. Since its inception, contemporary dance has been about pushing boundaries, exploration and experimentation, and delving beneath the veneer of social expectations. It’s not surprising then that the genre is sometimes viewed as dark, overly serious, even ugly. In considering this topic, I chatted to contemporary choreographers Larissa McGowan, Lina Limosani and Katrina Lazaroff. Joy is sweeter when we’ve known darkness. I was particularly interested in Limosani’s take on darker subjects in contemporary dance because she’s created dark, beautiful, even comical, works, which I found enthralling. As she points out, joy has less meaning without its opposite. ‘A Delicate Situation’ by Lina Limosani. photo by Chris Herzfeld, Camlight Productions. Humans experience a range of emotions. McGowan points out that contemporary dance explores a range of emotions. Contemporary dance isn’t all doom and gloom. All three choreographers express an opinion that it’s not true that all contemporary dance is dark. Is it about theme, or just aesthetic expectations? 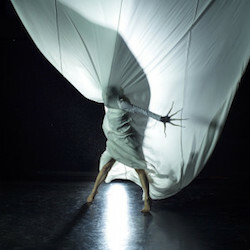 Contemporary dance is not the only dance form to tackle dark subjects, as McGowan points out. She continues, “Perhaps that’s why people say they don’t get contemporary dance – it’s abstract and weird, and sometimes people might think it’s ugly. But personally, I find that aesthetically more pleasing, because it is ever changing, and the body can almost do anything you want it to do, and contemporary dance allows you to explore that. So personal taste, and what you find aesthetically pleasing, and your own personal desires affect how you view and attach to movement. It’s not just the theme; it’s the quality and style. ‘Skeleton’ by Larissa McGowan, featuring Tobiah Booth-Remmers, Lisa Griffiths, Lewis Rankin. Photo by Chris Herzfeld, Camlight Productions. Contemporary dance is often playful and light. Despite its reputation for being serious and sometimes unpleasant, contemporary dance actually has a playful side. 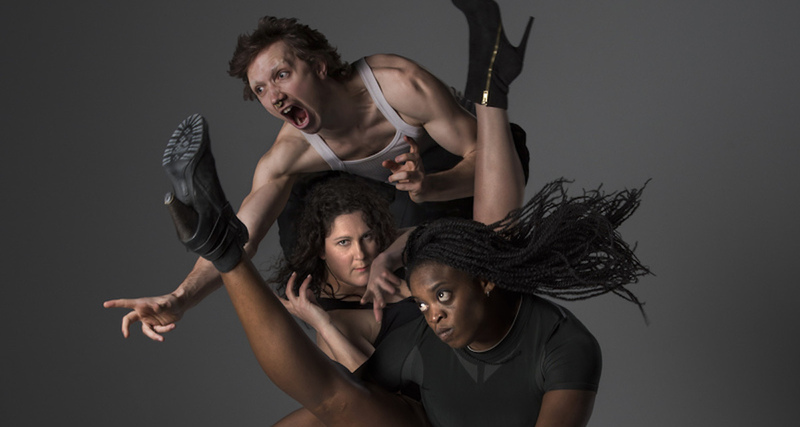 All three choreographers have created playful, and sometimes childishly naughty, works. But it is the inclusion of the playful with the serious that makes contemporary dance so powerful. “I have always had a sense of making work for an audience, not just for myself.” explains Larzaroff, whose works Involuntary, Wasted, and Quick Fix poke fun at the absurdities of modern life. Even Pomona Road, Lazaroff’s retelling of her experience in the horrific 1983 Ash Wednesday fires in South Australia, has elements of humour and play. 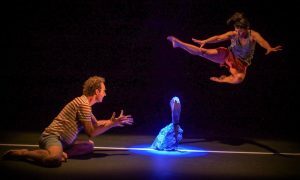 ‘One’s Wicked Ways’ presented as part of Australian Dance Theatre’s Ignition series in 2016. Photo by Tony Lewis. Joy can be found in unexpected places. Limosani questions common perceptions of what is joy. So for those of you who think contemporary dance can be too dark, I challenge you to go out and find some that isn’t. To find the choreographers who are playing with movement, tickling your sense of humour, and making sure you feel something when you’re sitting there in the dark and watching. If you allow yourself to see beyond the things you may have been trained to find ascetically pleasing, you’ll discover a richer palette of emotion, and the joy will be so much sweeter for it.